The teaching folder can be followed as a scheme of work, or used as individual lesson plans and allows students to explore the play Antigone (the Don Taylor edition) in its entirety. By using the folder you will ensure your students gain a thorough understanding of the whole play, its themes, context, ideas and characters, whilst ensuring you cover the assessment requirements for the new 2016 Edexcel exam, component 3. 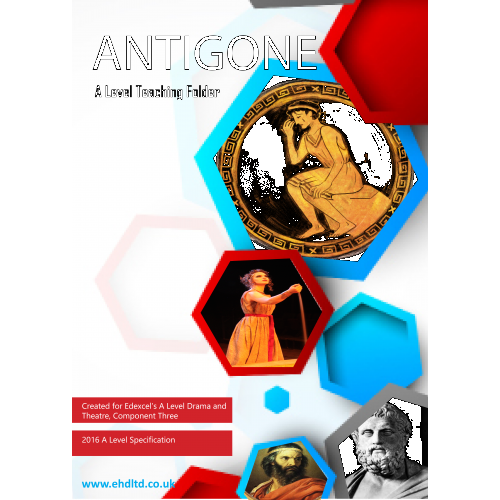 The folder suggests at least fifty teaching ideas for Antigone and includes a wealth of photocopiable handouts, including both practical and theory-based suggestions for making the teaching of the play fun and entertaining. Providing a variety of practical and theory-based activities, the folder guides teachers through analysis of the play, providing teaching ideas and resources which will allow students to research and discuss areas from Sophocles' background and intentions to the relevance of the play today. By working through the file you will ensure that students cover topics such as the conventions of tragedy, linguistic devices used by Sophocles, the characterisation of Antigone, relationships between characters, choral rehearsal techniques, interpretations of imagery, the history of Greek theatre, costume and differences, perceptions of death within the play, the religious context, choral performance elements, tragic flaw and hamartia to name but a few. It has been designed to be used as an entire scheme that will enable you to teach the entire play, section by section. However, the folder has been written in such a way so that you can insert your own theory and ideas depending upon your own chosen practitioner that you are studying. The folder will provide you with ample resources to help students understand the play's original performance conditions looking at aspects such as skenes, pinakes, eccyclema. It will provide you with detailed teaching ideas and handouts to study the characters from the viewpoint of a director and explore and develop ideas that will shape a complete production concept and interpretation of this play. The teaching ideas and handouts will help develop an understanding of historical, social and cultural context of the play including the original performance conditions and will also allow students to learn appropriate subject-specific terminology. The many practical teaching suggestions will enable students to participate in practical exploration that considers the ways in which the playwright has structured the text and uses plot, language, form, structure, characterisation and stagecraft to communicate ideas to an audience, the theory sheets will also help you to deliver information about the play's dramatic elements (for example, physicality, vocal expression, set, sound, costume, masks, and space) contribute to the development and shaping of ideas in performance. Guaranteed to save you hours of planning!